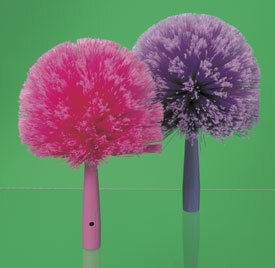 This Web Duster is made of 100% split-tipped, flagged synthetic fibers which are stapled on a plastic handle and hold more dust. Great for blinds, furniture, fans, and hard-to-reach areas. Fits any Acme standard threaded handle. Este guardapolvo está hecho de 100% fibras sintéticas cuales están engrapadas a un mango plástico y sostienen más polvo. Perfecto para cortinas, muebles, abanicos, y lugares difícil de alcanzar.